Raise your hand if you love French fries. Is that just about everyone? I don’t know about you, but I will finish off my cup of fries in the car before I even get home! Sometimes I even start dipping into my husbands stash… shh, don’t tell him! Fries boarder on what I would consider a controlled substance. I can’t eat just one…box! I thought making my own at home would help feed my addiction (literally), but really it’s just more work than it’s worth. Frying in all that oil, keeping the correct temperature, never walking away from the burner for fear that you may start a grease fire, etc. Additionally, fries from your local fast food joint are so cheap, why not just let them make them? Enter the baked “fries”. This is where the tables turn. So the “double garlic” feature in this recipe is garlic-infused olive oil, in which the fries are cooked. By the way, you’re entire kitchen will smell like roasted garlic – YUM! Then the garlic you used to infuse the oil, is sprinkled over top of the finished fries along with thinly sliced scallions. 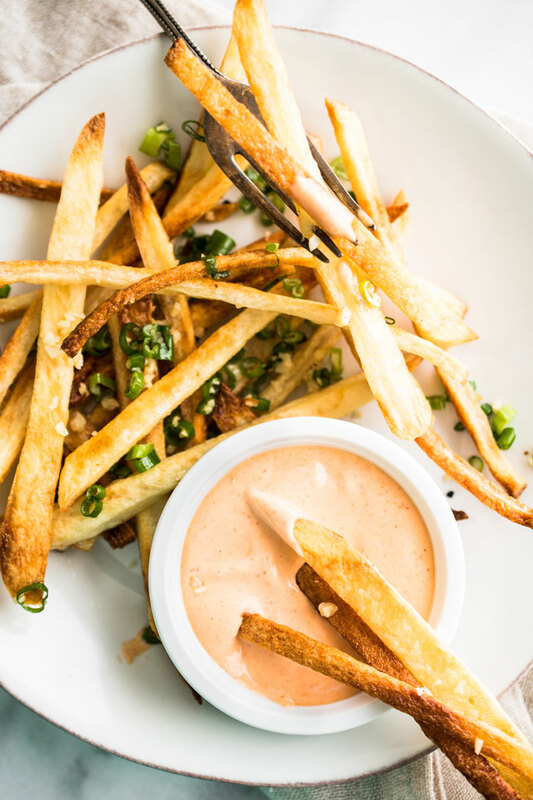 Dip those babies into some Sriracha-mayo and you’ll be in fries heaven! In a small saucepan, warm the olive oil over low heat. Add the garlic and allow the olive oil to infuse for 2 – 3 minutes. Using a fine meshed strainer, strain the garlic from the oil. Set aside, and do not discard either. Drain the water from the bowl containing the cut potatoes and pat them dry with paper towels. In a large bowl, add the dried potatoes and drizzle 2 tablespoons of the garlic-infused oil, ½ teaspoon of salt, and toss together. Line a baking sheet with foil and liberally spray with oil. Spread the potatoes evenly out onto the baking sheet, leaving space in between each potato stick. Bake, turning occasionally, for 25 - 30 minutes. Meanwhile, combine the mayo and Sriracha in a small bowl. Refrigerate until ready to use. In the same large bowl you just used to toss and coat the fries, add the minced garlic, scallions, and the remaining tablespoon of garlic-infused oil. Add the cooked fries and toss to coat. Taste and add more salt if needed. Serve with the Sriracha-mayo and enjoy! *Soaking the fries in water removes the starch and sugars that prevent the fries from achieving maximum crispiness. 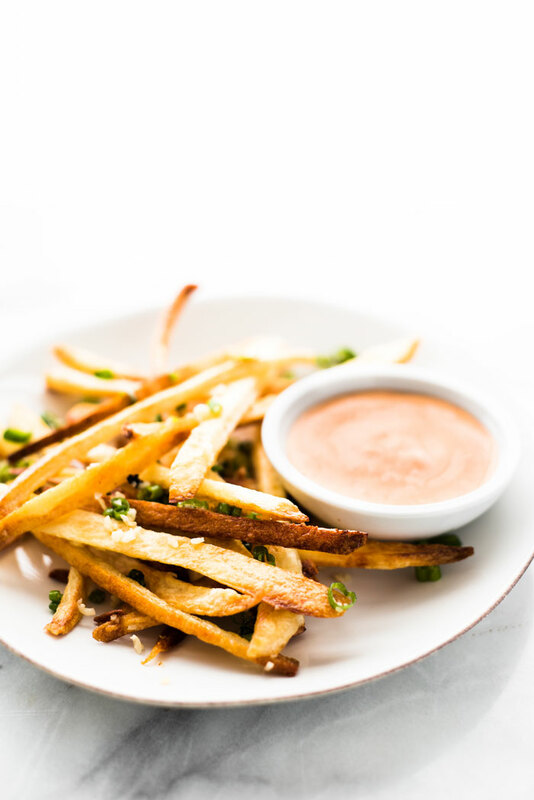 * Adapted from Ellie Krieger, Garlic "Fries"
Help me. I need those immediately. I am in love with fries and my baked ones never work that well!!! So soaking overnight in water, hmm? OK. I am about to head to shops and potatoes just got added to the list!!! 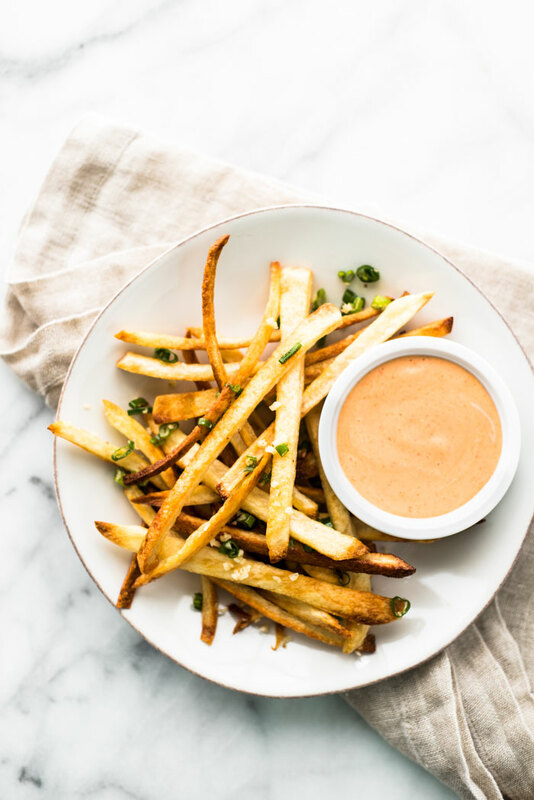 We love fries around here and oven baked are my favorite! Awesome video, pinned and shared! Hooray for oven baked fries!! They are sooo worth the extra little step of soaking to make them extra crisp and then there’s the dipping sauce. Sublime together! 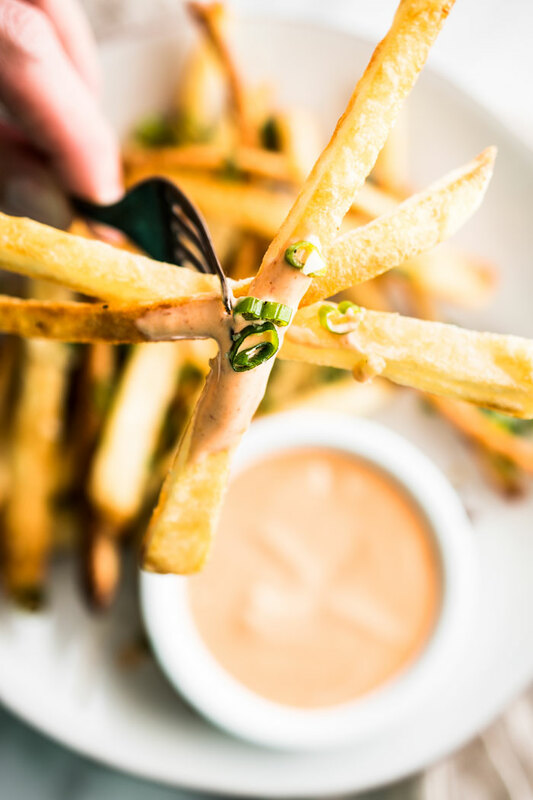 Love your addition of garlic and scallions at the end.. that little extra something take these fries over the top. Then your video. Kathleen. It is so well done. I’m completely inspired. I shot my first food video last week and I’m just learning how to edit it. It seems overwhelming while cooking to take photos and shoot video. I think I need to start with something simple while getting my feet wet! Will you give Arlo and Otis a good ear scratch for me? Your assistants are so sweet! Thank you for this my dear! I’m all about lots of garlic 🙂 Hope you have a wonderful weekend too and Happy St. Paddy’s Day! Ha! I guess that’s why controlled substances are regulated by someone other than yourself 😛 Have a happy St. Paddy’s day my dear! Hi Kathleen! I make my own baked big fries all the time, but have never thought to make french fries. Why oh why? These look and sound So good! I’d need that whole plate to myself, thank you, but they’re baked, so yay, no guilt! Off to post your amazing video on Facebook! Yeah… I DID eat the whole plate all by myself (sheepish grin) 😉 Thanks, Helen!